Hello crafters! Jennifer here, with a super sweet, yellow and pink baby card that I made for a friend's baby shower this month. After trimming all the extra white edges off my punch-outs and trimming my papers to size, I planned out my general arrangement to make sure I'd have enough room for everything and wouldn't run into problems once I had the adhesives out! In general, I like "dry" adhesives for paper-to-paper applications, so the Helmar Quick-Fix Permanent Adhesive Runner does a fabulous job of attaching the flat paper items to the card front. To add some interest to the b-a-b-y block images, I added Helmar ZapDots to the two B blocks. To amp up the sweetness of the card (because I know the recipient just can't get enough of it!) I added buttons tied with twine to the buggy wheels and a couple more buttons with ribbon bows tied on (tip: slip the bow or ribbon through the loop of twine on the back of the button before tying the twine snug for a more secure fit). To attach them to the card I trust Helmar Tacky Craft Glue to do the job. I returned to the Helmar Quick-Fix Permanent Adhesive Runner to affix two pieces of card stock and another trimmed punch-out to the inside of the card--nothing bulky to keep the card from closing, but just enough to dress up the message section. There are exceptions to every rule, and this is a prime example. Since my card has to travel through the mail and I really want to give my envelope decoration every opportunity to stay put, I dispensed with the "dry" adhesive and used Helmar Tacky Craft Glue, instead, to adhere the baby bottle cutout to the bottom left corner of the envelope. I've always found liquid adhesives better suited to the more rigorous trials of mail art due to the different type of bond they form between items. The last step was to add some pretty pen-work to the card and envelope. I used two shades of pink and a bright yellow to mimic the colors in my punch-outs and patterned paper. Then I filled out the card and popped it in the mail. I hope my friend enjoys it! P.S. This post marks the end of my first full year on the Helmar team, and I've got a look back at all my Helmar projects from the last 12 months over on my blog today. Come by and say hi! This isn't goodbye, though--you'll see a lot more from me in the coming six months as I'm staying on for another term! Hi I am Sharon a Design Team Member here for another 6 months. I love working with Helmar! I really love the Helmar Products and I used the Helmar Quickfix Adhesive Runner to add the handmade envelopes to my album to finish it off. You may add as many pages as you need and you can fill them with what ever you want to organize in this album. 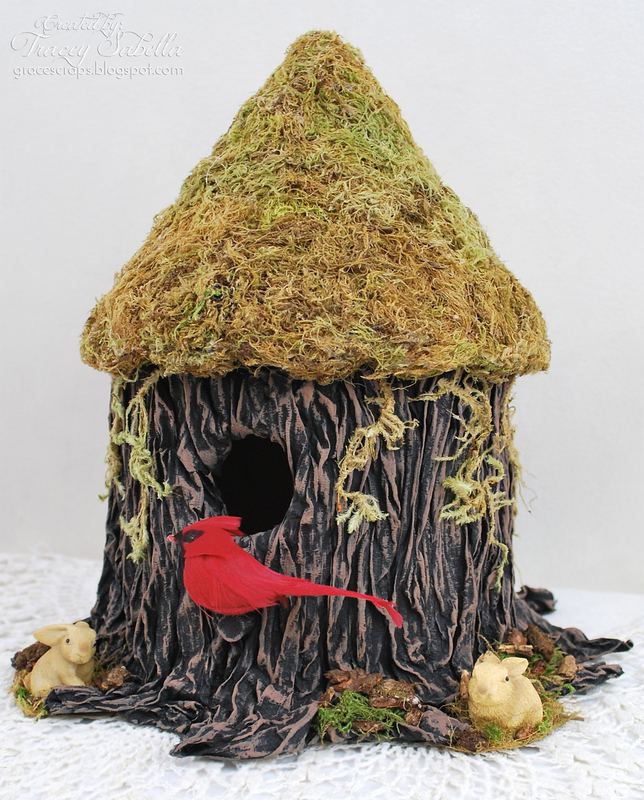 Have fun making this great craft project and using Helmar Products. Hi, Veronica here today to share with you my newest tag. I love making tags, they are little works of art and so fun to create. Today I would like to share two fabulous products. Using these adhesives made creating my tag so much easier. The Fabric glue was used to adhere my fibers and canvas fabric weave to my tag. I also adhered some burlap to my round chipboard piece. Helmar Fabric Glue is an awesome product. You can feel at ease knowing that all the hard work you put into your project will not be falling apart later. My next product that I used was the Helmar Liquid Scrap Dots. They are 3 dimensional and acid free. I used this instead of my square dots because I had small intricate cut to adhere and it was so easy just to dap some scrap dots on my die cut and glue right on. Thank you for stopping by today. I do hope you enjoyed my tag as much as I enjoyed sharing with you. For complete product list please come see my blog! Good morning everyone, Steph Ackerman here to share a travel journal I created from a repurposed book I found. This is a perfect sized book to take with you as you do some traveling. Fill it with notes about your trip, add mementos and photos of your journey. It's even a fun gift to give someone to use for their own traveling memories. Helmar Decoupage and Craft Paste was the perfect adhesive to use for my travel journal. Using a sponge, I brushed it on the chipboard cover then placed black cardstock on top. To adhere the second layer, I sponged the Decoupage Paste directly on the cardstock. Be sure to use the Helmar Scraper Tool to smooth out the paper on your journal and remove any wrinkles. Any excess Decoupage Paste is easily removed with a baby wipe. For the third and forth layers, I applied the Decoupage Paste directly to the papers and adhered them to the journal. Again the scraper was perfect for ensuring I had no wrinkles in the papers. I placed stickers on two strips of color which I then adhered across the center of the book with Decoupage Paste. I hope I've inspired you to create something fun to document your summer travels. Hi everyone!! It's Tracey here with my final project as a Helmar designer. I would like to thank Helmar for allowing me to design with their amazing adhesives over the past two years. I was a huge fan of Helmar 450 Quick Dry Adhesives before I joined the team because it adheres so well to all of my mixed media projects. Once I received my first generous package of Helmar adhesive I began to realize just how wonderful all their products are. It's been so much fun creating projects for all you Helmar fans out there! 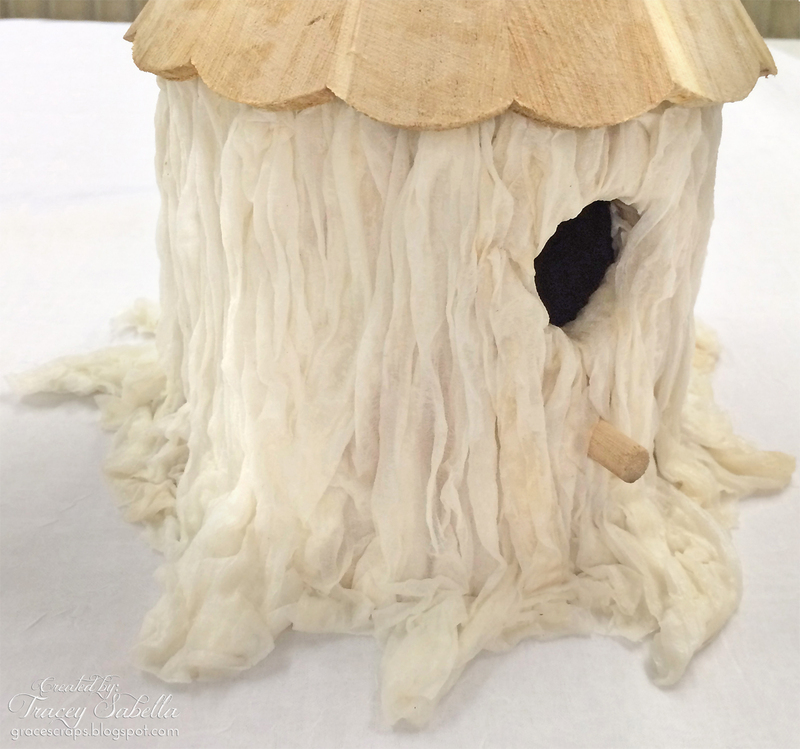 Today I'm sharing a fun and whimsical home decor project with you. Earlier this summer I discovered that my mom has developed a fondness for decorative birdhouses so I started to look for ideas. 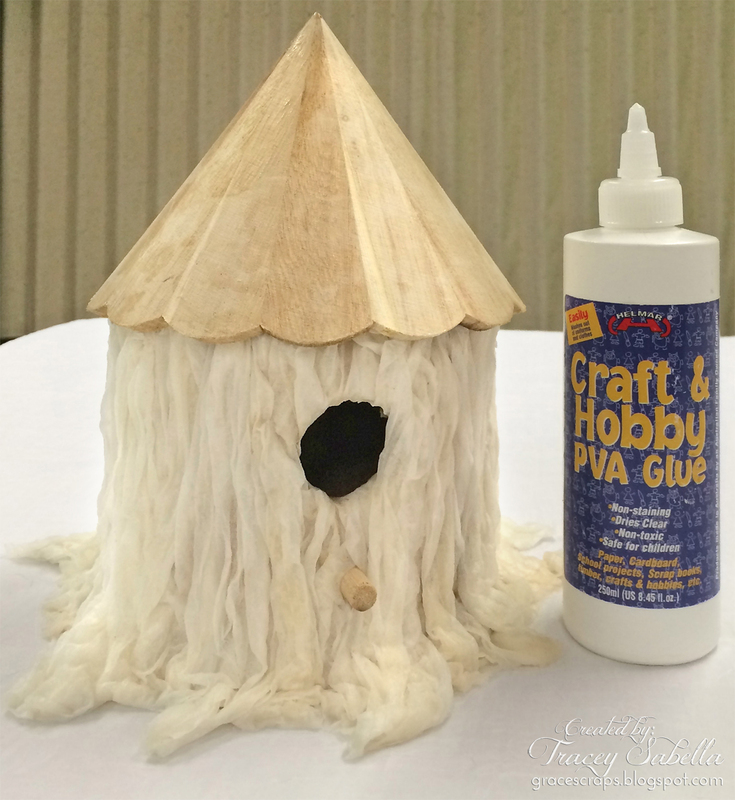 I found this faux bark technique used for fairy houses and thought I'd give it a try on this birdhouse featuring Helmar Craft & Hobby PVA Glue. I found a roll of Viva Paper towels that only has ridges in the design (no swirls) that I thought would work well for the tree bark. I mixed together a solution of about half water and half Helmar Craft & Hobby PVA Glue. I poured some onto a paper plate that had a slick finish that wouldn't absorb the glue mixture. Lay one sheet of paper towel into the glue mixture at a time, squeezing out the excess glue. Place the wet towel on a craft mat and scrunch it with your fingers to form vertical folds. Lay the wet, scrunched towed on the surface where you want to create the faux bark. Continue to apply the scrunched towel sections until you've worked your way all around the base with one layer. Additional layers can be added if desired to build up gnarls and roots. Here's a close-up for a better view of the texture. It doesn't look like much, but the paint brings it to life. Place your project on waxed paper or a non-stick craft mat to dry completely before painting. I left mine overnight, but depending on how wet the toweling is, it might take longer to dry. Start by painting the background black. You can spray paint this part. I had a couple old bottles of black craft glue I wanted to use up, so I watered it down and brushed it on. Be sure to get into all the crevices. Allow the paint to dry. I used a heat tool to speed up the process. Then use a foam brush to lightly apply brown paint to bring out the textures. The color and amount of paint are up to personal preference. Isn't this texture so life-like and wonderful? My mom adores cardinals and rabbits, so I embellished the tree with both. Moss is adhered to the roof using Helmar 450 Quick Dry Adhesive. 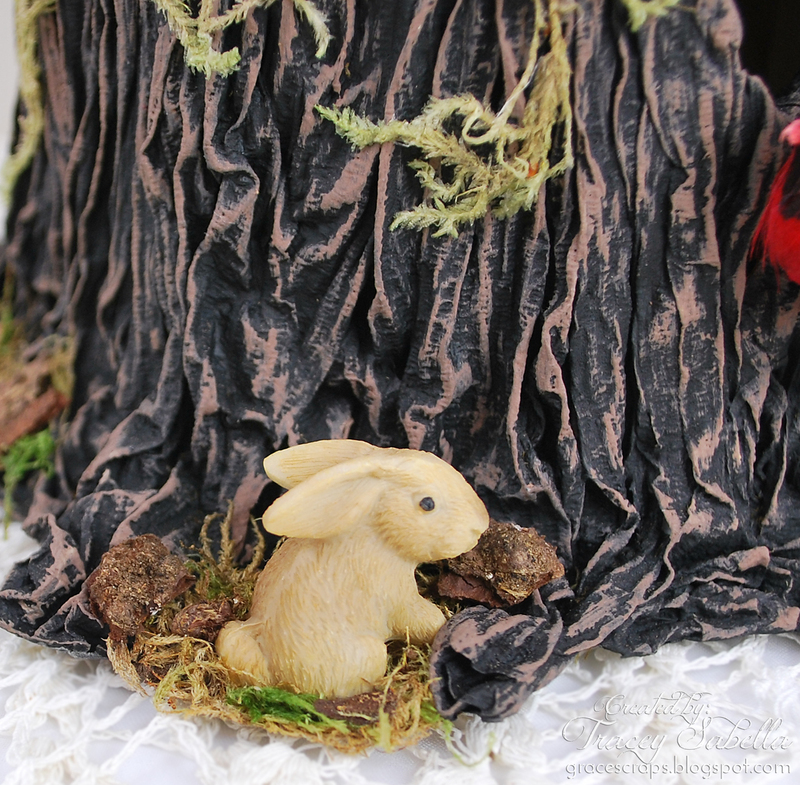 I cut out small pieces of kraft cardstock to fit between the roots for a place to put the rabbits. 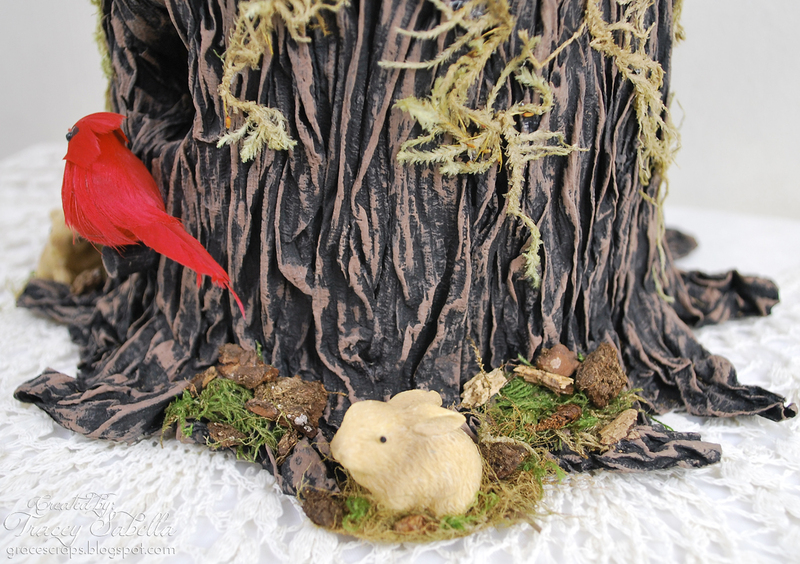 I adhered the paper with Helmar 450 Quick Dry Adhesive, along with the rabbit, then used Helmar Super-Tac EVA Glue to adhere moss, bits of bark, and twigs here and there around the base of the tree. I created hanging vines from the roof by adhering strings of moss with Helmar Premium Craft Glue. I hope you've been inspired to grab your Helmar glue and some paper towels to create a faux bark project of your own. Hey good people! If you haven't noticed I have a thing for books. While I am not a book collector, it's something about handmade books that is awesome. Include personal artwork and I could melt in your presence. I also looooove color and I try my best to develop projects that reflect my love of it. Helmar helps pull those things together. This is my project for today. Thanks to the Arnold Grummer Zig Zag Books that I love so much, my cutting only consisted of: the front and back cover pages and the seam binding. All I had to do was create the artwork for the covers for the book boards. I may add some additional doodling, so I used the Helmar Crystal Kote Fixative Spray (workable matte). I then cut my book covers and used the Helmar Acid Free Glue, which is key for bookbinding, no matter how big or small the pages are. After placing the glue on the board I flipped it over and stuck to the paper. Smoothing the paper out with my hands, making sure there were no bubbles. I then clipped the corners, for a neater fold. I take the zig zagged (accordion folded) inner book pages and adhere the front flap to the front board cover. Then I proceeded to coloring some seam binding and sandwiching that between the back book cover and the inside pages. As expected, I did a big more doodelicious detail work. Added a resin faced paper flower, adhered with some Helmar Craft & Hobby PVA. I also cut some leaves and stem for the flowerhead I wanted to use. Doesn't it make you smile? I know it works for me!! I hope you enjoyed my project today and that you LIVEan AWESOME LIFE full of COLOR and Creativity bonded with a little Helmar!! Thank you for stopping by!!! Happy pre-fall to everyone! Today I'm here sharing my last creative post for the Helmar Design Team. It has been far beyond a pleasure designing for this company, however, due to personal issues I need to step down from designing for a while. I will continue to share my work on social media sites so please always look for the Helmar hashtag for more creative designs. To begin today's tag design, I first covered my tag and wood embellishments with gesso. Being careful to lightly cover the tag with a thin layer that way the design of the tag still shows. Next begin to create your layers using various pattern papers, paint, stamping then molding paste using stencils. Now on to the dimensional layers. For this tag it's all about Zapdots. I used Helmar 1/4" Zapdots White Square and 1/2" Zapdots White Square to create dimension. Position your Zapdots behind each of your embellishments and even behind florals to create the desired height. Here's the end result of my chunky gratitude tag. Upclose of the layers created using Helmar Zapdots. I hope you have been inspired to create using Helmar Zapdots to add dimension to your creations. I absolutely love adding layers to my work. Hello! This is Martice, here to share a fun (and of course) colorful project with you. This will be my last post on the Helmar blog as a design team member so before I share my tutorial, I want to give you a big 'THANK YOU' for all of your generous comments, shares and encouragement. I truly appreciate every kind word! I like to use ATCs, or artist trading cards, to experiment with textures, patterns and color combos. Today, I'm sharing how I combine all three to create simple sentiments to help keep me motivated and inspired throughout my day. Select a monochromatic color palette or use all the colors of the rainbow! I like papers that have a bit of texture + pattern on them. Since my style is very bold with colors and shapes, I naturally chose papers with tropical colors and hand-drawn or stamped details. Give your ATCs a burst of glimmer! Brush on gold metallic paint (DecoArt Dazzling Metallics - Champagne Gold) in select areas. Tear strips from an envelope that has a decorated inside. (This "decoration" is a security feature that can be found on some envelopes.) I found a really cool one that reminded me of tribal patterns! Apply a drop of Helmar Decoupage and Craft Paste on each end of the strip. Fold ends to secure in place. STEP 4// Smear black gesso on top of the patterned paper strip. Use your finger or a dry paintbrush to add black gesso in the center of the patterned strip. Let dry. First, make sure the gesso is completely dry! Using a white pen or marker, write your messages. You can never go wrong with Helmar Crystal Kote Gloss Varnish! Spray two layers and you're done. This varnish has really great coverage and dries very fast. I love how the colors remain vibrant and the crystal clear finish is perfect! For extra bling, hole punch one corner, insert a strip of sari ribbon and thread on a few glass beads. I hope you've enjoyed this tutorial! Happy creating! Be sure to follow Martice on her blog to catch more tutorials featuring Helmar products. There is just something alluring about falling leaves, cooler weather and Autumn crafts that make me smile.This is the cover for a particular art journal that I recently created using some Helmar 450 Quick Dry Adhesive and the Helmar Decoupage & Craft Paste. After covering the journal in some of my handmade Mulberry paper that I made using my Arnold Grummer Paper Making Kit, which I then hand sewed the title onto; I added a pressed Mulberry leaf to the front using Helmar 450 Quick Dry Adhesive. I just love how beautifully clear and smooth the Decoupage & Craft Glue works on top of such a fragile item like a pressed leaf and how well the 450 Adhesive holds the wheat stalk to the paper. Would you like to see what is inside the book and why I call it Fall Naps? I also added a poem to her and if you want to get any tips about about hand sewing a title onto your paper or to hear what the poem is, then please visit my You Tube channel and please subscribe because I love making videos and sharing my inspiration with you. Kathleen here with the wonderful company Helmar. It is my pleasure to announce that I have been asked back for another six months! After gathering supplies I begin by creating a story board to see how everything fits together. I then cut the papers to size and the holes for the rings are punched out, now it is time to apply some Helmar Decoupage & Craft Paste and adhere it to the acrylic boards. I also used the Helmar Decoupage & Craft Paste to glue my papers down. Now it's time to add stickers and chipboard. Here I used Helmar Liquid Scrap Dots under the flower stamen to give it height and Helmar Premium Craft Glue to apply the heavier cloth flowers in place. I hope this project has inspired you today. It is always a delight when you stop by. And, as always, don't forget to use your favorite Helmar products on your next project! Check out How to Create a Mini Album by Kathleen White on Snapguide. All paper are from my stash as pieces of scrap.